I don't know about you, but I cannot comprehend that today is the last day of 2015! Honestly, I don't know where it went. Each day sort of seems like a big blur to me now. It was a hard year for us. and you may be a bit weary of hearing it. and, for months, I have hesitated to talk about the part I am getting ready to share. because, perhaps it can bless someone else and give them hope to see how He has tunneled a path through our circumstances. laptop on lap, and I began to file our taxes online. so I assumed that this year would be no different. I worked through the amazingly easy process of online tax preparation, and I hit send, like always. Soon, I heard the little beep alerting me that an email had come through. "The Internal Revenue Service has rejected your tax return. The reason is that taxes have already been filed in your name and social security number..."
Blah, blah, blah, after that....I didn't care to read the rest. It felt like my blood pressure spiked. Aren't we always very careful? So mindful of our privacy. Putting safe security measures in place. My "what?" and "how?" questions quickly changed to "WHO????" Who would do this to us? Our carefully-shielded privacy felt so invaded upon. And this small act, my dear friends, was the beginning of one of the most frustrating, aggravating ordeals I can describe to you. To spare the mundane details, I found it near-impossible to speak with an actual human being. I so wanted an answer! I didn't want to have to wait until morning to hear an explanation of what had truly happened. Finally, I reached a human voice, who informed me that, based upon the wording of our email from the IRS, our identity had possibly been stolen, but, he couldn't tell me anything for certain. After realizing I was pretty much wasting my time by trying to get a definite answer, I politely said thank you, good-bye, and hung up. Early the next morning, I quietly slipped out of our house, without waking my dear husband who had worked all night or Zach, who was still sleeping, and I drove over 60 miles to the closest office of the Internal Revenue Service. I got my little number, and I sat and waited for a very long time to see a representative. All the while I waited, I convinced myself that there had been a mistake. and our personal identity was safe. quiet sort of guy, who, though he was kind, was very non-committal and professional, to a fault. and I could wake up to "normal life" now. six days before I tried to file them on February 4th! But, how, I asked him? but trying to wrench information out of them is like trying to pull an eye tooth right out of their strictly-business head! This man, however pleasant he might have been, was NOT budging. He was not telling me anything. He wasn't telling, so I may as well stop wasting my breath. All he would truly reveal is that someone had indeed, beat us to the punch, and already filed OUR taxes before we could file them, in hopes that they would get our refund! and to bring Kevin back with me as soon as possible. This journey began our quest to prove that we are who we really are. I find that in "my words" I have no words...to describe the level of despair one can reach while trying to prove that they are who they really are. and I will focus on what this whole ordeal has taught me. But, Cheryl Smith is not who I really am. My social security number is what it is. and those nine numbers do NOT define me. and the last name I was given the day I stood at the altar in front of a preacher when I gave up my maiden name and took on Kevin's last name, is only a means of "identifying" me, in this life. If I were to enter some government protection program, or for some other reason I took upon a whole new name, it would have no bearing upon who I really am. Because who I really am...that person inside of me....that soul that God placed there - the part of me that will return to Him when I die, has nothing whatsoever to do with the first name, Cheryl, or the last name, Smith. Trying to prove that I am Cheryl Smith was one of the worst nightmares I have walked through. Feeling like we had been violated and that someone else was going to get what was rightfully ours was extremely hard to endure. But, through it all, God showed me that I am who I am, no matter what. That He doesn't identify me as Cheryl Smith. That Cheryl is just a name to identify who I am, in this life. That this life isn't the life that really matters. and that is the name that counts. "Whoever has ears, let them hear what the Spirit says to the churches. To the one who is victorious, I will give some of the hidden manna. I will also give that person a white stone with a new name written on it, known only to the one who receives it." I, at times, have fought a lot of ill feelings towards whomever it was that inflicted these burdens upon us. They will more than likely never know how much anguish they have caused. I won't bore you with the ordeals we have endured trying to remove weird things from our credit report and trying to fix the mess they have created. my family and I have learned some of the most valuable lessons of our lives. There was a moment in time, when victory came, my anger subsided, and then turned to gratitude. we have learned to lean hard upon God. in hopes that these facts will comfort you in your own struggles and whatever you may be facing. regardless of what happens to our "identifying factors" in this life. No one can steal that, take it away from us, or assume it as their own. It is ours...our own...our individual inheritance that cannot be touched or destroyed by anything or anyone in this life. I don't know about you, but that part about "an inheritance, incorruptible, and undefiled, and that fadeth not away, reserved in Heaven for you" just thrills my inmost soul! and bless His holy name, even satan himself cannot pluck us out of His hand! neither shall any man pluck them out of My hand." but God, Himself, is going to take care of us, no matter what. to fulfill His purpose and to supply our needs. God's friendship is one that is deeper than all others. He sticks closer to us than even a brother, and the precious Holy Spirit is a Comforter that never fails. "For thou shalt worship no other god: for the LORD, whose name is Jealous, is a jealous God..."
He wants to be our "all in all". whether they be financial, physical, or spiritual. making them our "gods" and sources of deliverance and sustenance. The strongest, most dependable of human safety nets and back-up plans can fail. When we reach the end of our own resources, He hasn't yet begun to unveil His. There are certain situations in this life that are completely beyond human help. and nothing short of Divine intervention will do. and the monies owed to us were released. They even paid us a little interest! Oh, how we rejoiced when the storm was over! God has blessed us again and again. And He has proven Himself faithful to us. He has absolutely convinced us that He is our all in all. That if we have Him, we truly have all we need. That He keeps His promises, and we should keep ours to Him. Truly, on this last evening of the year, I have never known Him better or loved Him more. for their Defender is strong; He will take up their case against you." "...my spirit rejoices in God my Savior..."
"And Abraham called the name of that place Jehovah-jireh. As it is said to this day, In the mount of Jehovah it shall be provided." "And when all things shall be subdued unto Him, then shall the Son also Himself be subject unto Him that put all things under Him, that God may be all in all." I close out this year and look forward to the new one ahead with the assurance that God is enough. When all else fails, and when hope is gone, He remains. we came across several more little items to give away! but this shopping trip will not weary you, I promise! Here's a quick preview of what you will find available tonight! email and let us know, and Lord willing, it will soon be on its way to your mailbox!!! I hope to see you there, and I can't wait to share! "Whereas ye know not what shall be on the morrow. For what is your life? It is even a vapor, that appeareth for a little time, and then vanisheth away." Am I the only person who feels like this has been the fastest moving year of all time? Honestly, I feel like we just started 2015! and Christmas is coming in only one more day!!! I know I say that a lot...but I just can't keep it in! Everything about Christmas warms my heart. There is a certain feeling in the air that is like no other. put it in a bottle, and dispense a little bit of it every day of the year? Don't you wish you could make it all last? and then us, giving loving gifts to one another. The gifts we exchange do not have to be elaborate...or costly...or huge. Sometimes, the tiniest gifts are the most precious of all. I got to thinking about how much I enjoyed that book giveaway. Can I just tell you how true this is? You probably already know that, but I just can't say it enough. I met some new friends, and you won't believe what else happened! of Kevin's and mine from years and years ago!! and, oh, it has been just wonderful to rekindle this old friendship! along with a picture of her and her beautiful family. I am so looking forward to keeping in touch with her! It pays to mind Him. He never lays something upon a heart without a Divine purpose for good. there are many things we are coming across that we just really don't need anymore. and passing things along here to you throughout the year? So today, Homespun Devotions celebrates the grand opening of a new "store"! But, this isn't just any kind of store, trust me. will be yours for the asking! We just want to give...that's all. This will work just like the book giveaway. Remember the Scripture I shared with you in that post? will be to contact us and ask for it...first, before anyone else. You can email us privately for the item, or you can leave a comment. 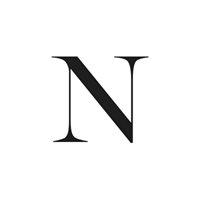 Provide your mailing address to us, (privately, of course), and it will be yours. We will NEVER share your address or personal details with anyone. Now, due to shipping costs, we will have to keep the items small, obviously. may be interested in, we will post a picture to the "FREE Stuff" page. You can come by as often as you want and window shop. If something catches your eye, just ask for it, and you will be blessed! because if just feels so wonderful to give! Money never has meant a whole lot to me. I would just as soon give most of the rest away. Great happiness comes from giving. Of the 13 original books up for grabs, there is only one left! We would love to get it out in the mail to someone who could use it. Could that someone be you???? in order to send her the book, but, so far, I haven't heard back. no matter how hard I try, I have no possible way of connecting with you. and leave some way for me to get back in touch with you! We really want to bless you, and anonymous commenters leave us no way of doing that! Today, during our "Grand Opening", we added several more items! and clicking on the tab that says, "FREE Stuff"! He is so good to us. As the year winds down, I have been doing a lot of thinking and evaluating. This year has been really, really tough for my family and me. Honestly, dear Zach told me last night that this has been one of the hardest years of his life. Bless his heart...it was hard on this mama's heart to hear that. Especially, in light of the past difficult years and things he has endured. I see the hand of our Redeemer. Oh, I do love Him, dear friends! He allows the hard places, but He walks the rocky path right alongside us. Bless His holy name forever and ever! perhaps He will lead me to share at least part of the trials of 2015. I continually seek His face for direction. And, I am His...yielded, surrendered, and willing to follow His lead. For now, let's continue to enjoy the wonders of this blessed season by adding yet a couple more Christmas music videos! 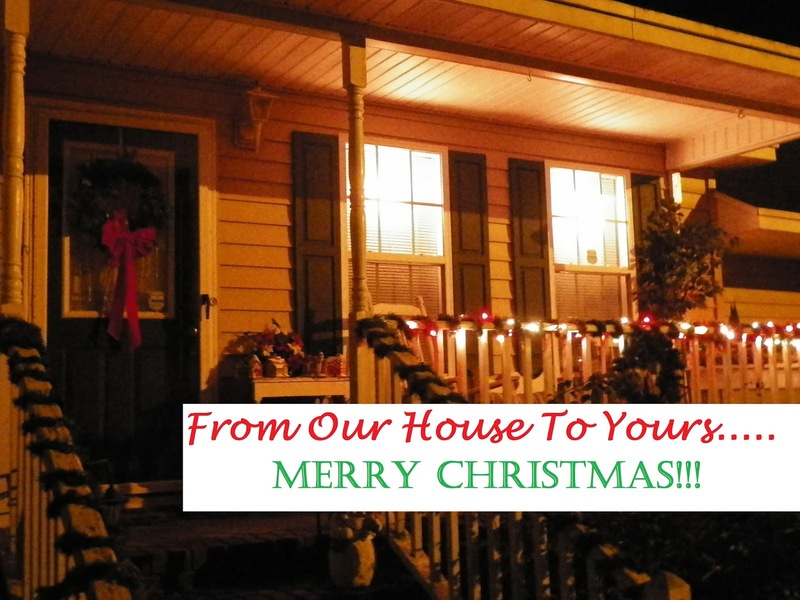 I never tire of hearing these dear, old carols. These are so inspiring and are beautifully performed by two BYU a cappella groups. I hope you can find the time to watch! and a sense of worship to my soul! why don't you go give something away? that is still in good shape, but you really don't need anymore? Why not pass it along and make someone else's day? not grudgingly, or of necessity: for God loveth a cheerful giver." I send my love to every one of you faithful readers. Each one of you are dear to my heart. Aren't you glad we serve a living God? One Who is always awake and Who is ever mindful of our problems? Praise our wonderful Lord for a Savior like ours! all the way to the ears of Almighty God. and she said the surgeon just came in and said that his surgery could not have gone any better!!! Will you please take a moment to stop and thank the Lord with me? Here is a picture of this sweet boy right after surgery. Dear friends, please keep praying! The concern now is that he can come off the ventilator and be able to start breathing again on his own, without assistance. To God be the glory for bringing him this far and for all He will continue to do for Brody! Regardless of medical prognoses, prayer changes things, and God is not limited. in spite of what the family has been told! God wants us to ask Him for the things we desire. "..ask, and ye shall receive, that your joy may be full." With men it is impossible, but not with God: for with God all things are possible." Be not afraid, only believe." Did you notice the color of those words? and He repeats them now to you...and to me, dear friend. Let us keep the faith, and keep interceding on behalf of little Brody. Lord willing, I will continue to post updates as they are made available to me. 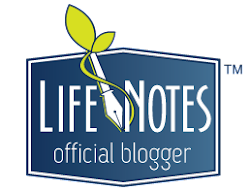 something new that is coming to Homespun Devotions! Jesus knows and understands every, single emotion we will ever face in this life. as a human, with its many heartaches, toils, and cares. for He suffered more human anguish and brokenness than any of us can even imagine. and His great, compassionate heart is deeply moved and touched with the feeling of our infirmities. He watches from on high, and He sees every tear that falls. He hurts each time we are wounded. And He intercedes to His/our Father, continually on our behalf. in full assurance that He is listening to our prayers, and He cares more than we will ever comprehend. SMA Type 1, spinal muscular atrophy, and is not expected to live past 15 months or so. so the family would truly appreciate your prayers during this time. The hospital is reserving a room in ICU, just in case there are complications. bombarding Heaven with intercessory prayer. 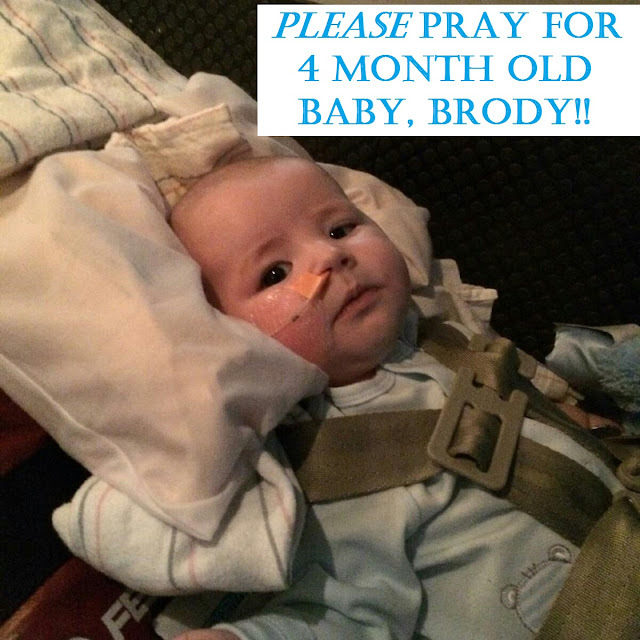 This sweet baby needs a miracle, and he needs prayer warriors to pray him through. so he could go have his time with the Lord and pray. he said, "Mama, that baby is going to live!" and how He opened my barren womb for one moment in time to allow him to be conceived. A God Who can do that, after my diagnosis and 12 1/2 years of marriage and many years of infertility struggles, can do anything, my friends! Zach is a miracle in every sense of the word. and now that same faith inspires him to pray for others who also need miracles. As he prays, and we pray, will you please join our prayers? 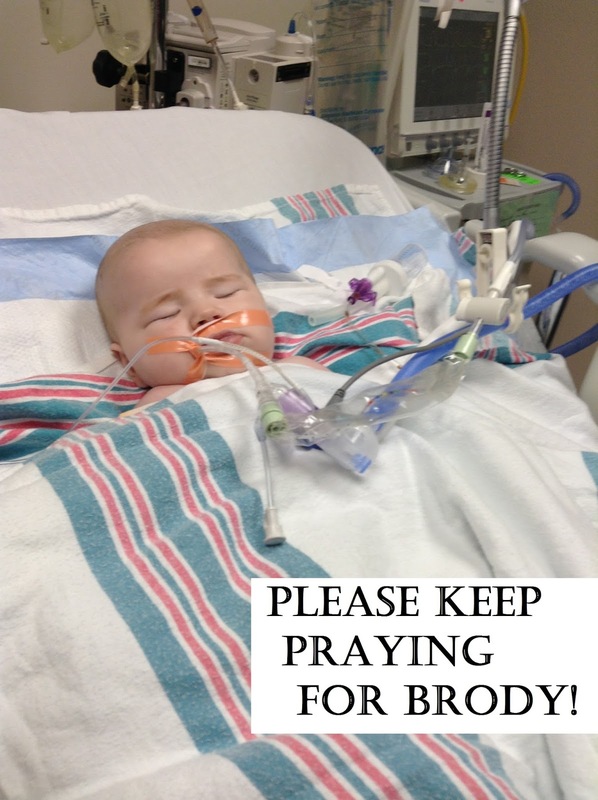 Please pray for Brody's healing and for peace for his family during this trying time. In spite of medical diagnoses, God still reigns. In closing, I would like to repeat a testimony I have shared here before involving my dear mother. When Mom was nine years old, she was stricken with polio and rheumatic fever, simultaneously. was, understandably, very alarmed and concerned. Papaw believed in Divine healing, and his faith was nothing short of amazing. and lay hands on her and pray, as instructed in James 5:14,15. "Bro. McCoy, don't look at the affliction. Look to the power of God!" They prayed, and God answered. out of bed, sitting in a rocking chair downstairs, singing! He said it was the sweetest music he had ever heard. That was many years ago, and Mom lived to the ripe, old age of 84. Both Papaw and Mom now wait for me in Glory. Their race is run, their crown is won. and God is still God! I have seen what He can do....first hand, many times over. and to present him a living, breathing testimony of His power. Let us pray and believe together for the Christmas miracle this dear baby needs. Please share this prayer request tonight and tomorrow with every prayer warrior you know! Thank you for reading, and thank you for your faithfulness to pray. Each one of you are so precious and dear to my heart! as I was seeking God's will about something that concerns my family and me. and in that prayer, I asked Him to give me a certain "sign" to confirm what I felt He was already showing me. and linking up with for quite a while. Of course, she had no idea what I was privately praying about. But, He worked through her...and He spoke straight to my heart through her words. I couldn't believe my eyes, so I emailed her and told her about what had happened. and God had prompted her to go outside on her porch and compose that email to her blog followers. It wasn't even her normal time to send out that email!!! from almost 3,000 miles away!!! all the way across the country from me! She minded God, and in that obedience, she helped God answer my prayer! Both of us were astonished. and how God always works on both ends of a problem and/or situation. or what wonderful door we may open for Him to work through! and this dear lady has blessed me more times than I can even express. Her love for Jesus is evident in every, single post she writes. Her heart for children deeply challenges me and is an amazing thing to witness. God is using her to change the world...one little life at a time. so you already know how special she is! Cheryl: Could you please give us an introduction as to who you are? Jen: I'm Jen Avellaneda, a Northwest native who blogs at Rich Faith Rising and is a contributing author at Missional Women. I've been married for twenty-three years. My husband and I have been foster parents for the past decade. We are also adoptive parents. We are parents to four children; two biological kids, a nine-year-old adopted daughter, and an almost three-year-old we have as a foster daughter and hope to adopt. I also speak, occasionally, and will be in Denver this April to speak at the Missional Women Conference. Cheryl: What are your passions and the causes closest to your heart? Jen: My heart beats for family and also for adoption. Coincidentally just before this, I was doing a personal study on the word “blessing”, and I was astonished to discover that the very first mention of “blessing” is in correlation with “being fruitful” and “multiplying” (Gen 1:22 & 28). I love God's model of family, and I love the beauty found in His picture of adoption. In my experience, adoption is not something to bow our heads low about or be ashamed of...but something we can raise and open our hands to, rejoice over, and celebrate. I am not sure what I would have done if He hadn't taken me in...broken, neglected, abandoned, and disconnected...and called me into His family. It excites me that God is no respecters of persons. His club is not exclusive. Biblical unity is also something that stirs in me deeply. With so much division in our nation lately, I find it comforting that one thing God's Spirit does for us (if we let Him) is unites us together. Our family, (I wish you could meet them in person), just so happens to be this beautiful palette of Latin, Caucasian, Bi-racial, African-American, and Samoan. It's so much fun to get to represent our multi-faceted, people-loving, good, and unifying God every time we simply walk into a store together, and I very openly and voluntarily love discussing adoption and foster care, every, single chance I get. I love how, although it's easy to try and make a mold for God, He won't fit into some box. Lastly, I am passionate about missions and discipleship. Often, it's easier to convert someone, than to choose to walk in the trenches with other people. Still, I love how God says He walks with us through the valley. Oh how thankful I am that He does that! Cheryl: Can you share with us about your foster-parenting journey? How many children have you fostered? What has been the most difficult part? What about it has fulfilled you the most? Jen: Thanks for asking about fostering, Cheryl. Like I mentioned, our family has been fostering for ten years. It is something that has been on my heart since I was a little girl. As a child, I grew up in a big house with just one sibling. I remember begging my mom, "It's just not fair, there are so many kids out there who need families, and we have this big house. We HAVE to do something." As a little girl I used to line up my dolls in cribs all around my room and pretend that I had an orphanage. All I can say is, I think fostering is something God deposited in me, even before I was born. In the past decade we have fostered over a dozen kids. We usually only take one child at a time because in raising our older two, our goal was to really keep balance between family and our calling to foster. The most difficult part? Well, you could probably guess...saying "goodbye". (I only wish I was made of steel!) The truth is, often it takes less than five minutes for me to fall in love with these children. But we realize, it's ultimately His multiplying love that transforms lives...so when we love big, getting hurt can, sadly, just be part of the journey. God also often gives me a much-needed reminder that this calling is about serving Him, dispersing His heart, and living for His will. It's not about our feelings. What has fulfilled me the most? Seeing the transforming power of His love in the lives of these children. Love is always worth the risk. And honestly, I couldn't imagine more fulfilling work! There is nothing like seeing a child who reportedly hits, bites, and throws things, come into our home and, by His grace, leave gentle, kind, and patient. Or others come traumatized and paralyzed with fear and in just a few months they are walking, talking, smiling, and laughing. God still heals wounds and is so gracious. It is such humbling work. We feel honored to be doing it. It is like having a front row seat to His miracles and goodness every, single day. Cheryl: I so admire your heart for orphans. When did you first feel led to become an advocate for them, and what life event triggered this calling? Cheryl: How did your time in China and Guatemala affect and influence your mission to help orphans? Jen: It's funny that you mentioned both of these trips, as these were the two that significantly changed me the most. Words can't even summarize what I saw in China; heartbreaking situations, countless children abandoned. It was everything you might see or think about when you hear about a government orphanage in China. I will never forget those faces, the ones left in those cribs, so many almond eyes staring deep into your soul, as if begging for hope, and for someone, anyone to reach them. Our family's Guatemala trip was monumental in our fostering decision. We had already started our paperwork when we left, but the trip really cemented our calling in every sense. On this trip, my husband and I took our older two children, stayed at an orphanage, and really "caught" the calling to where we were willing to walk out orphan ministry in full faith and dependence on Him. We had the gift of traveling around the country with The Kaitlin's Mobility Foundation and helped to disperse wheel chairs to special needs kids. My husband and I also led a team of five children from America to do Children's Ministry in schools and villages throughout the country. One government orphanage we ministered at was heart-breaking. I lost my late Grandmother Jade's cross necklace there. At the time, I was upset, but looking back, God reminded me, that's where Jesus would have likely been if He had gone to Guatemala. He reminded me that the cross represents His gospel, and that He wants all people to know Him, even the most unlikely children trapped behind barbed wire in remote orphanages in Guatemala. Cheryl: Can you share with us about the adoption of your daughter, Nicole? 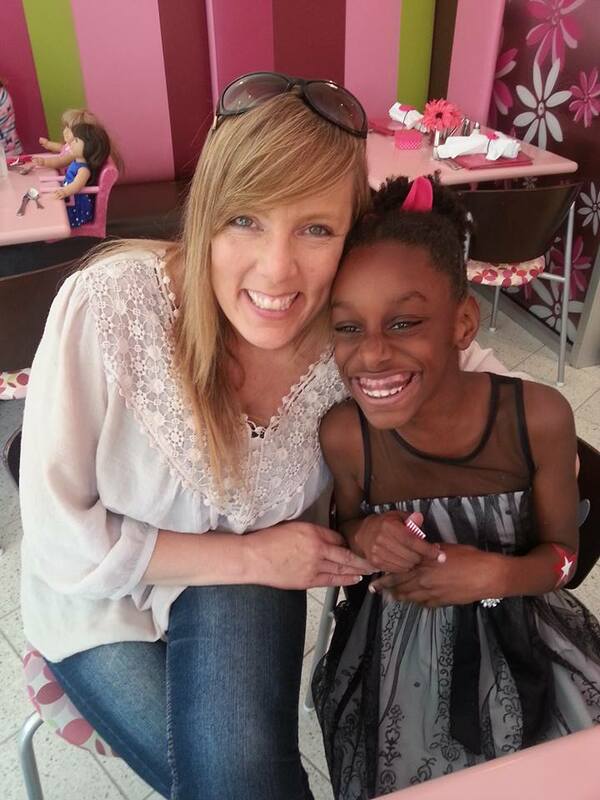 Jen: Nicole came to us as a foster daughter at three and a half months old. She was this beautiful bundle that we all instantly fell in love with. Her beginning was hard, but the road to adopting her was fairly simple and pain-free. Originally, when applying to be foster parents, we had not signed up to adopt, only foster, but when we knew this baby wouldn't be returning to her biological family, it was an easy decision and pretty much a no-brainer that we were meant to adopt her. Nicole faces some unique circumstances in that she is part deaf. Nicole is now nine and loves life and people. God's hand has always seemed to be with this child. Adopting her and realizing that you CAN love an adopted child as much as any biological child, has also ignited our hearts for adoption even more. Too often, we only hear about the hard things in foster care and adoption. But the truth is, beauty is all around caring for needy children, and I wish people knew just how much His grace simply saturates this type of ministry. Cheryl: How long have you been blogging, and how has it enriched your life? Jen: I started blogging in 2011. It's crazy because I actually grew up dyslexic. I "slipped through the cracks" some might say and barely graduated. Before I was married, I had never read an entire book in my life. Then, I met my husband. He grew up in an elite British school and has an I.Q. that I have heard reported to be in the one-sixties. (Slightly intimidating, right?) When we got married, I was determined to push myself to read. I ended up reading progressively well, and even ended up going to college and getting a degree. But something was missing. It was like I had this voice inside me desperately trying to get out. When I first started blogging, I was completely anonymous. I was scared of my voice, my own words...and even more frightened that those who might read them would somehow reject me. Eventually, I found my voice and years later now I try to use my words to express His heart, less as a way to understand myself and more as a tool I can use to glorify Him and reach others with His truth and love. Thank you Cheryl, for giving me this opportunity to share a little bit of my story. You’re a blessing and such a gift. Thanks for your patience and encouragement in my writing journey." Truly I am the one who is blessed...believe me, dear friend. 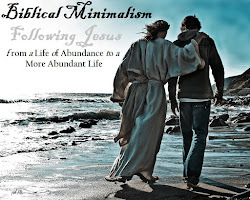 I do hope you will take the time to click here to be directed to Jen's blog, Rich Faith Rising. You will definitely be blessed and leave there encouraged! Inasmuch as ye have done it unto one of the least of these My brethren, ye have done it unto Me." To read previous interviews, click the links below.